In recent decades, incompatibility genes—which prevent pollen from germinating or growing into the stigma of a flower—have been discovered in many angiosperm species. If plants do not have compatible genes, the pollen tube stops growing. Self-incompatibility is controlled by the S (sterility) locus. Pollen tubes have to grow through the tissue of the stigma and style before they can enter the ovule. The carpel is selective in the type of pollen it allows to grow inside. 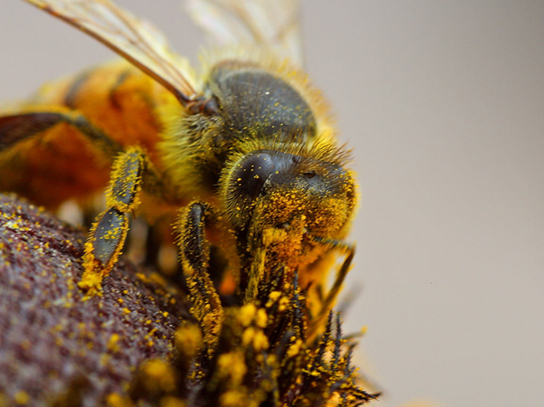 The interaction is primarily between the pollen and the stigma epidermal cells. In some plants, like cabbage, the pollen is rejected at the surface of the stigma, and the unwanted pollen does not germinate. In other plants, pollen tube germination is arrested after growing one-third the length of the style, leading to pollen tube death. Pollen tube death is due either to apoptosis (programmed cell death) or to degradation of pollen tube RNA. The degradation results from the activity of a ribonuclease encoded by the S locus. The ribonuclease is secreted from the cells of the style in the extracellular matrix, which lies alongside the growing pollen tube. Bees are perhaps the most important pollinator of many garden plants and most commercial fruit trees (Figure 1). The most common species of bees are bumblebees and honeybees. Since bees cannot see the color red, bee-pollinated flowers usually have shades of blue, yellow, or other colors. Bees collect energy-rich pollen or nectar for their survival and energy needs. They visit flowers that are open during the day, are brightly colored, have a strong aroma or scent, and have a tubular shape, typically with the presence of a nectar guide. A nectar guide includes regions on the flower petals that are visible only to bees, and not to humans; it helps to guide bees to the center of the flower, thus making the pollination process more efficient. The pollen sticks to the bees’ fuzzy hair, and when the bee visits another flower, some of the pollen is transferred to the second flower. Recently, there have been many reports about the declining population of honeybees. Many flowers will remain unpollinated and not bear seed if honeybees disappear. The impact on commercial fruit growers could be devastating. Butterflies, such as the monarch, pollinate many garden flowers and wildflowers, which usually occur in clusters. These flowers are brightly colored, have a strong fragrance, are open during the day, and have nectar guides to make access to nectar easier. The pollen is picked up and carried on the butterfly’s limbs. Moths, on the other hand, pollinate flowers during the late afternoon and night. The flowers pollinated by moths are pale or white and are flat, enabling the moths to land. One well-studied example of a moth-pollinated plant is the yucca plant, which is pollinated by the yucca moth. The shape of the flower and moth have adapted in such a way as to allow successful pollination. The moth deposits pollen on the sticky stigma for fertilization to occur later. The female moth also deposits eggs into the ovary. As the eggs develop into larvae, they obtain food from the flower and developing seeds. Thus, both the insect and flower benefit from each other in this symbiotic relationship. 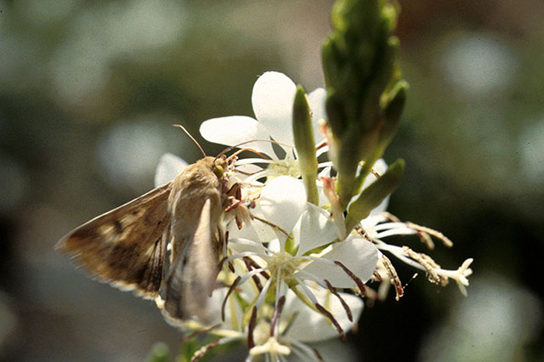 The corn earworm moth and Gaura plant have a similar relationship (Figure 2). 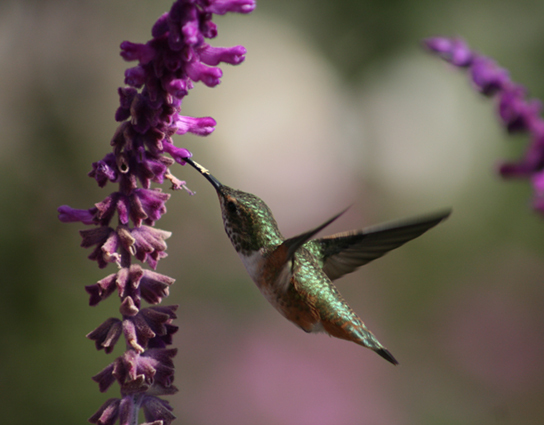 Many species of small birds, such as the hummingbird (Figure 3) and sun birds, are pollinators for plants such as orchids and other wildflowers. Flowers visited by birds are usually sturdy and are oriented in such a way as to allow the birds to stay near the flower without getting their wings entangled in the nearby flowers. The flower typically has a curved, tubular shape, which allows access for the bird’s beak. Brightly colored, odorless flowers that are open during the day are pollinated by birds. As a bird seeks energy-rich nectar, pollen is deposited on the bird’s head and neck and is then transferred to the next flower it visits. Botanists have been known to determine the range of extinct plants by collecting and identifying pollen from 200-year-old bird specimens from the same site. Figure 4. 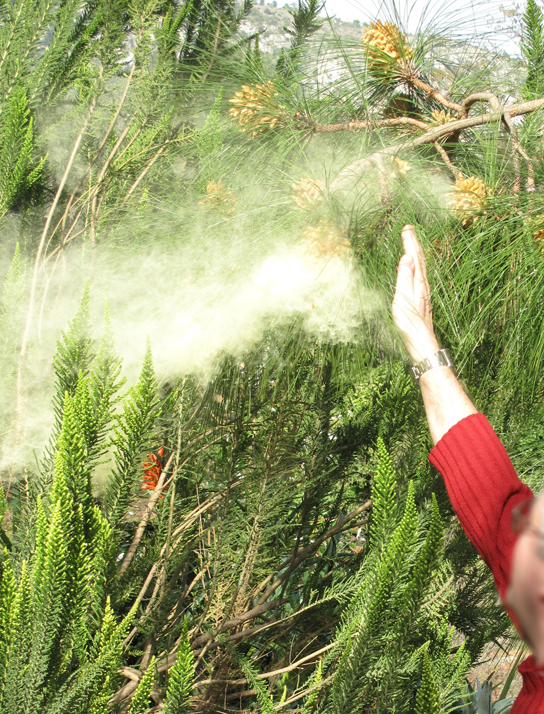 A person knocks pollen from a pine tree. Most species of conifers, and many angiosperms, such as grasses, maples and oaks, are pollinated by wind. Pine cones are brown and unscented, while the flowers of wind-pollinated angiosperm species are usually green, small, may have small or no petals, and produce large amounts of pollen. Unlike the typical insect-pollinated flowers, flowers adapted to pollination by wind do not produce nectar or scent. In wind-pollinated species, the microsporangia hang out of the flower, and, as the wind blows, the lightweight pollen is carried with it (Figure 4). The flowers usually emerge early in the spring, before the leaves, so that the leaves do not block the movement of the wind. The pollen is deposited on the exposed feathery stigma of the flower (Figure 5). Figure 5. These male (a) and female (b) catkins are from the goat willow tree (Salix caprea). Note how both structures are light and feathery to better disperse and catch the wind-blown pollen. Orchids are highly valued flowers, with many rare varieties (Figure 6). They grow in a range of specific habitats, mainly in the tropics of Asia, South America, and Central America. 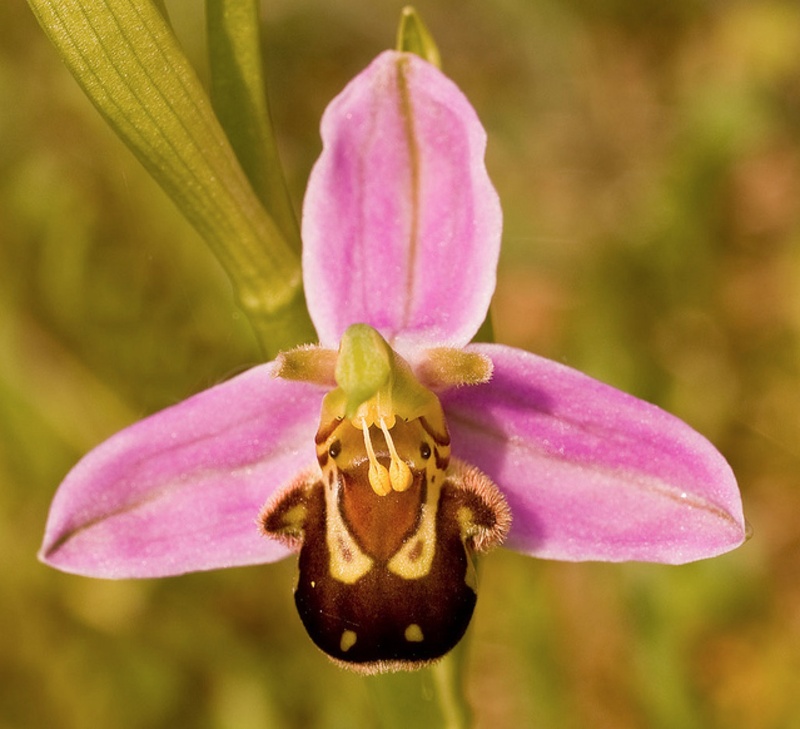 At least 25,000 species of orchids have been identified. After pollen is deposited on the stigma, it must germinate and grow through the style to reach the ovule. The microspores, or the pollen, contain two cells: the pollen tube cell and the generative cell. The pollen tube cell grows into a pollen tube through which the generative cell travels. The germination of the pollen tube requires water, oxygen, and certain chemical signals. As it travels through the style to reach the embryo sac, the pollen tube’s growth is supported by the tissues of the style. In the meantime, if the generative cell has not already split into two cells, it now divides to form two sperm cells. 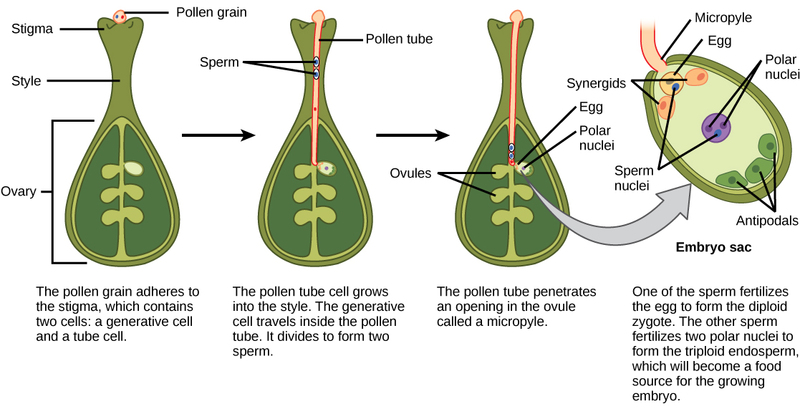 The pollen tube is guided by the chemicals secreted by the synergids present in the embryo sac, and it enters the ovule sac through the micropyle. Of the two sperm cells, one sperm fertilizes the egg cell, forming a diploid zygote; the other sperm fuses with the two polar nuclei, forming a triploid cell that develops into the endosperm. Together, these two fertilization events in angiosperms are known as double fertilization (Figure 7). After fertilization is complete, no other sperm can enter. The fertilized ovule forms the seed, whereas the tissues of the ovary become the fruit, usually enveloping the seed. Figure 7. In angiosperms, one sperm fertilizes the egg to form the 2n zygote, and the other sperm fertilizes the central cell to form the 3nendosperm. This is called a double fertilization. After fertilization, the zygote divides to form two cells: the upper cell, or terminal cell, and the lower, or basal, cell. The division of the basal cell gives rise to the suspensor, which eventually makes connection with the maternal tissue. The suspensor provides a route for nutrition to be transported from the mother plant to the growing embryo. The terminal cell also divides, giving rise to a globular-shaped proembryo (Figure 8a). In dicots (eudicots), the developing embryo has a heart shape, due to the presence of the two rudimentary cotyledons (Figure 8b). In non-endospermic dicots, such as Capsella bursa, the endosperm develops initially, but is then digested, and the food reserves are moved into the two cotyledons. As the embryo and cotyledons enlarge, they run out of room inside the developing seed, and are forced to bend (Figure 8c). Ultimately, the embryo and cotyledons fill the seed (Figure 8d), and the seed is ready for dispersal. Embryonic development is suspended after some time, and growth is resumed only when the seed germinates. The developing seedling will rely on the food reserves stored in the cotyledons until the first set of leaves begin photosynthesis. The mature ovule develops into the seed. A typical seed contains a seed coat, cotyledons, endosperm, and a single embryo (Figure 9). Figure 9. The structures of dicot and monocot seeds are shown. Dicots (left) have two cotyledons. Monocots, such as corn (right), have one cotyledon, called the scutellum; it channels nutrition to the growing embryo. Both monocot and dicot embryos have a plumule that forms the leaves, a hypocotyl that forms the stem, and a radicle that forms the root. 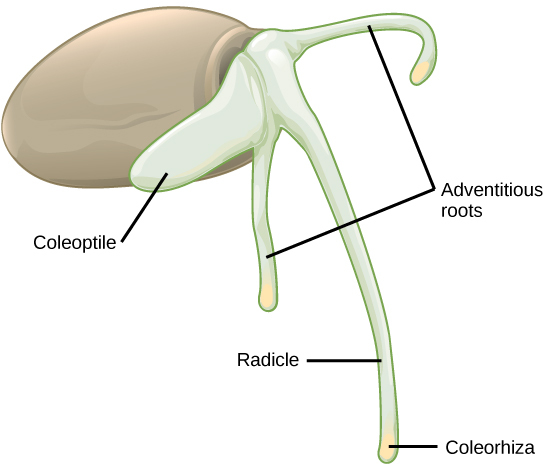 The embryonic axis comprises everything between the plumule and the radicle, not including the cotyledon(s). What is of the following statements is true? The embryonic axis consists of three parts: the plumule, the radicle, and the hypocotyl. The portion of the embryo between the cotyledon attachment point and the radicle is known as the hypocotyl (hypocotyl means “below the cotyledons”). The embryonic axis terminates in a radicle (the embryonic root), which is the region from which the root will develop. In dicots, the hypocotyls extend above ground, giving rise to the stem of the plant. In monocots, the hypocotyl does not show above ground because monocots do not exhibit stem elongation. 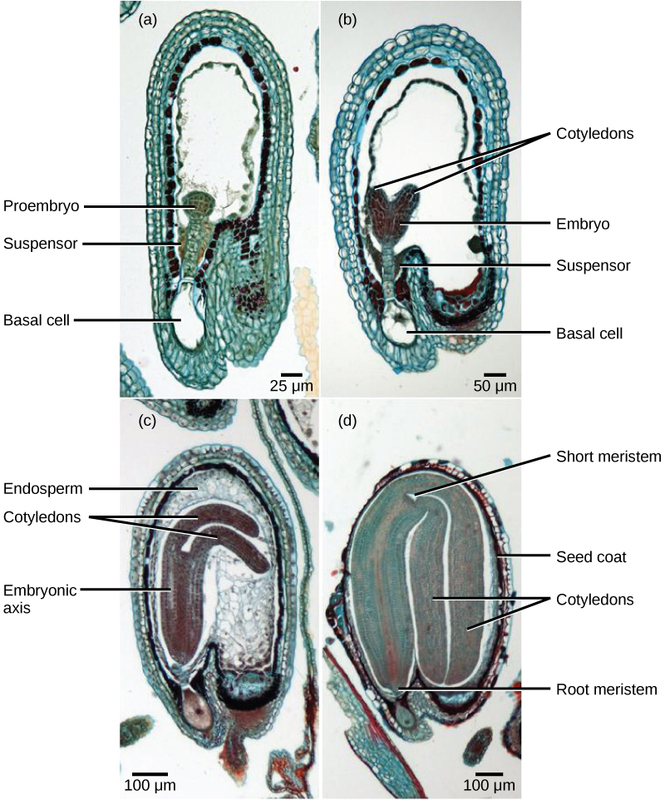 The part of the embryonic axis that projects above the cotyledons is known as the epicotyl. The plumuleis composed of the epicotyl, young leaves, and the shoot apical meristem. Figure 10. As this monocot grass seed germinates, the primary root, or radicle, emerges first, followed by the primary shoot, or coleoptile, and the adventitious roots. In monocot seeds (Figure 10), the testa and tegmen of the seed coat are fused. As the seed germinates, the primary root emerges, protected by the root-tip covering: the coleorhiza. Next, the primary shoot emerges, protected by the coleoptile: the covering of the shoot tip. Upon exposure to light (i.e. when the plumule has exited the soil and the protective coleoptile is no longer needed), elongation of the coleoptile ceases and the leaves expand and unfold. At the other end of the embryonic axis, the primary root soon dies, while other, adventitious roots (roots that do not arise from the usual place – i.e. the root) emerge from the base of the stem. This gives the monocot a fibrous root system. Many mature seeds enter a period of inactivity, or extremely low metabolic activity: a process known as dormancy, which may last for months, years or even centuries. Dormancy helps keep seeds viable during unfavorable conditions. Upon a return to favorable conditions, seed germination takes place. Favorable conditions could be as diverse as moisture, light, cold, fire, or chemical treatments. After heavy rains, many new seedlings emerge. Forest fires also lead to the emergence of new seedlings. Some seeds require vernalization (cold treatment) before they can germinate. This guarantees that seeds produced by plants in temperate climates will not germinate until the spring. Plants growing in hot climates may have seeds that need a heat treatment in order to germinate, to avoid germination in the hot, dry summers. In many seeds, the presence of a thick seed coat retards the ability to germinate. Scarification, which includes mechanical or chemical processes to soften the seed coat, is often employed before germination. Presoaking in hot water, or passing through an acid environment, such as an animal’s digestive tract, may also be employed. 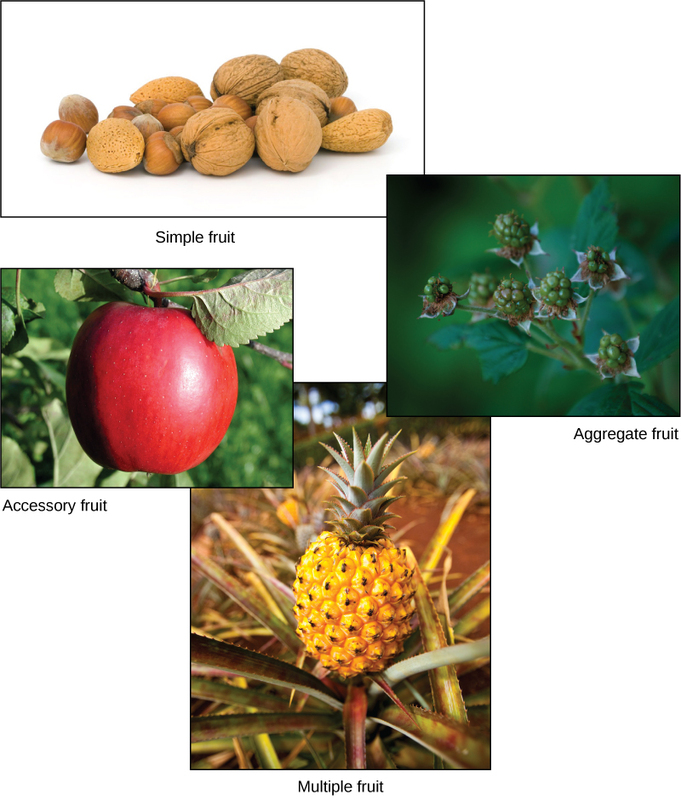 Fruits may be classified as simple, aggregate, multiple, or accessory, depending on their origin (Figure 11). If the fruit develops from a single carpel or fused carpels of a single ovary, it is known as a simple fruit, as seen in nuts and beans. An aggregate fruit is one that develops from more than one carpel, but all are in the same flower: the mature carpels fuse together to form the entire fruit, as seen in the raspberry. Multiple fruit develops from an inflorescence or a cluster of flowers. An example is the pineapple, where the flowers fuse together to form the fruit. Accessory fruits (sometimes called false fruits) are not derived from the ovary, but from another part of the flower, such as the receptacle (strawberry) or the hypanthium (apples and pears). Fruits generally have three parts: the exocarp (the outermost skin or covering), the mesocarp (middle part of the fruit), and theendocarp (the inner part of the fruit). Together, all three are known as the pericarp. The mesocarp is usually the fleshy, edible part of the fruit; however, in some fruits, such as the almond, the endocarp is the edible part. In many fruits, two or all three of the layers are fused, and are indistinguishable at maturity. Fruits can be dry or fleshy. Furthermore, fruits can be divided into dehiscent or indehiscent types. Dehiscent fruits, such as peas, readily release their seeds, while indehiscent fruits, like peaches, rely on decay to release their seeds. Some fruit have built-in mechanisms so they can disperse by themselves, whereas others require the help of agents like wind, water, and animals (Figure 12). Modifications in seed structure, composition, and size help in dispersal. Wind-dispersed fruit are lightweight and may have wing-like appendages that allow them to be carried by the wind. Some have a parachute-like structure to keep them afloat. Some fruits—for example, the dandelion—have hairy, weightless structures that are suited to dispersal by wind.